In the late 1980s, actor-comedian Robin Williams saw his flailing screen career revived by Good Morning, Vietnam and Dead Poets Society, both released through the Disney subsidiary Touchstone. 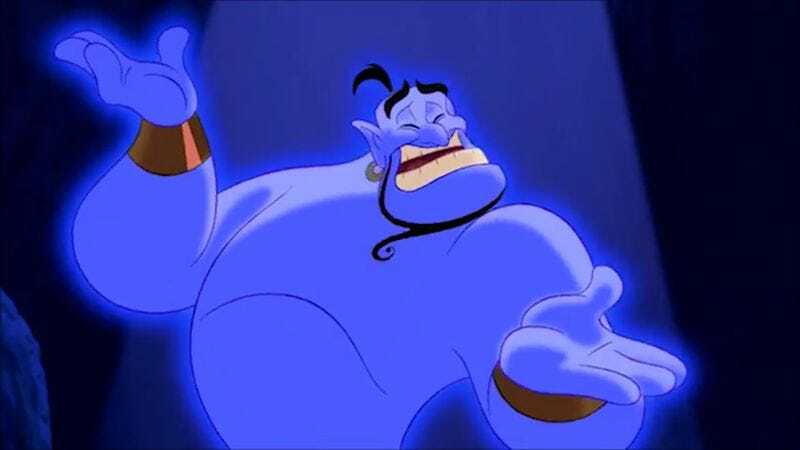 In gratitude, he agreed to take a pay cut and voice the fast-talking, pop-culture-reference-making Genie in Disney’s Aladdin for SAG scale. His only real proviso was that Disney not overemphasize the character in the advertising. Disney agreed and then proceeded to overemphasize the holy hell out of the character in the advertising anyway. These and other developments are discussed in “The History Of Robin Williams As The Genie,” an episode of the webseries Cartoons 101. This nine-minute minidocumentary reveals that the actor and the company had a fraught, complicated relationship that spanned years. While they considered John Candy and Eddie Murphy for the part, the makers of Aladdin always wanted Williams as their Genie. They even went so far as to make an animation test, using audio from Williams’ 1979 comedy album Reality… What A Concept. The comedian threw himself into the role, recording 16 hours of material for the film. Still in all, he didn’t want his performance in Aladdin to overshadow the release of Toys, a passion project he’d been working on with director Barry Levinson. But that’s exactly how things turned out. Genie was all over the ads and merchandise, while Toys bombed. Williams put the blame squarely on Jeffrey Katzenberg, who was then in charge of Disney’s motion picture division. He even referred to the executive as “Jeffrey Katzen-bug” in a speech at the Golden Globes. With Williams walking away from the role, Dan Castellaneta of The Simpsons became Disney’s replacement Genie for a number of straight-to-video sequels, plus video games and an animated series. But after receiving an apology from Disney, Williams did return for 1996’s Aladdin And The King Of Thieves. After that, Williams only did his Genie voice in educational material, with Castellaneta playing the role in the strictly-for-fun projects. Williams last played the character in an obscure point-and-click math game. Bummer. But what about those hours of unused Williams audio in the Disney vaults? Sorry, fans, but the comedian had a clause in his will preventing those tapes from being used posthumously. So Castellaneta is the Genie from here on out, it seems.